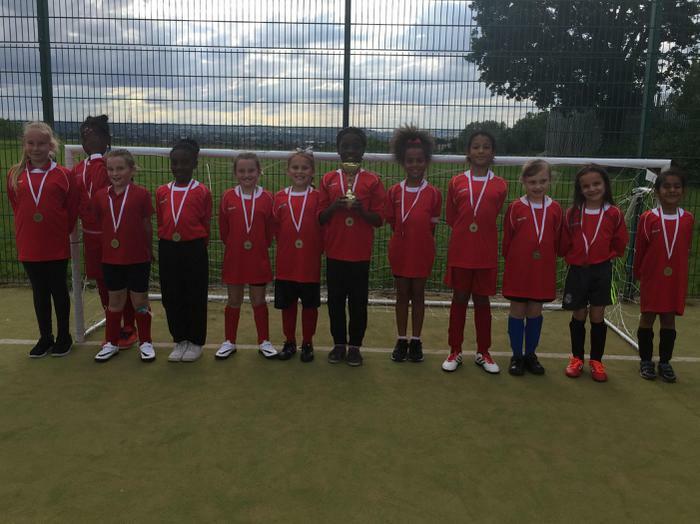 On Tuesday 12 July, a team of girls from years 3, 4, 5 & 6 took part in the Mary Ryan Girls Cup competition at Good Shepherd Primary School against year 6 girls teams from St Winifred's and Good Shepherd primary schools. Our first match was a 3-1 victory over Good Shepherd “Black” and saw Alyssia Mundle score a brilliant hat-trick after going a goal down. Match two finished in a very close 0-0 draw with St Winifred's. St Winifred’s defended well and we just couldn't break them down. Our final group match was against Good Shepperd “White”. A moment of brilliance from Alyssia Mundle, to score the only goal of the game giving us a 1-0 win and taking us into the final again against Good Shepherd “White”. Another close game that ended with a 0-0 draw, so the tournament was to be decided with a penalty shoot out. After three penalties each it was tied at 1-1 and was now sudden death. The next two penalties were missed. Good Shepherd stepped up and missed their next penalty. So it was all down to Taija Myers, she approached the penalty spot nervously, but struck the ball and in it went, making us the Mary Ryan Cup winners for 2017. It was a brilliant team performance from all the girls and they deservedly came home with the trophy. 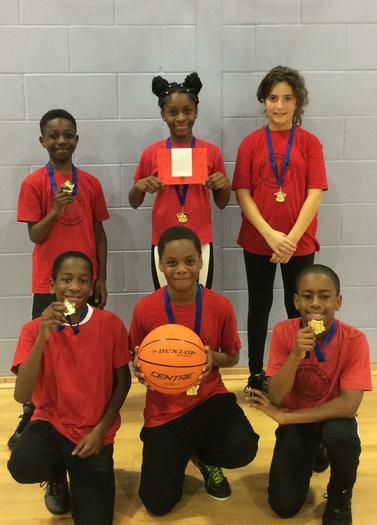 Downderry were invited to the annual mixed basketball team competition at Bonus Pastor School. The team won every game and took first place overall. Well done to you all, great teamwork and tenacity paid off! Forget Rio, here at Downderry we have our own fantastic sports day! Over the course of the week, we have had three thrilling sports days, starting with Early Years on Tuesday, then Key Stage 1 and Key Stage 2 on Wednesday. Although the weather was not on our side, it didn’t dampen the enthusiasm of the pupils and supporters. There were some wacky races, and some challenging sprints, and over all a great week of sport. A HUGE thank you to everyone who came to watch and support our competitors! Year 3 and 4 girls were invited to attend the Whitefoot Lane football tournament. It was a cracking start, with the girls winning their first game 1-0. Our second game, finished with a draw, whilst our last game we lost 0-1. Despite our lose, these great results qualified us for the final. The final was an intense game that finished 0-0, which therefore led to extra time. All the girls fought hard and tried their absolute hardest, but unfortunately one last minute goal left the score 0-1 to the other team. Year 5 and 6 pupils competed in the Lewisham Primary Schools swimming gala against swimmers from 21 other schools. Sujeeth made it into the Butterfly final, finishing 4th and Skylar made the Freestyle final finishing 5th. Luke qualified for all four finals, winning Silver in the Butterfly, and Bronze in the Backstroke and Breaststroke, and finishing 2nd best year 6 boy overall. Benite, Aiysha, Vethuja and Sandra also took part in individual events and relays. A team of Downderry pupils from years 1 and 2 took part in a Multi Skills festival at Bonus Pastor to try out agility, balancing and coordination skills. The team was divided in to two teams to compete against each other in a friendly and fun way. The atmosphere was electric with so many children working hard racing with big feet, balancing on benches, bouncing balls, skipping, throwing bean bags and many more exciting activities. At Downderry, we are lucky enough to have two up and coming sporting stars amongst us. Suraj, in year 6, and Alyssia, year 5 and both been selected to play for their districts in their favourite sports. For the past few seasons, Alyssia has been training and playing for Charlton Athletic, this year she was selected for the district side, where she will compete for Lewisham football team. Suraj has been selected for his district cricket team. Last season, Suraj was awarded bowler of the year and selected for a trial with Bromley Cricket club, which was successful. Both children attend our cricket and football after school clubs. Well done from everyone here at Downderry, watch this space England! 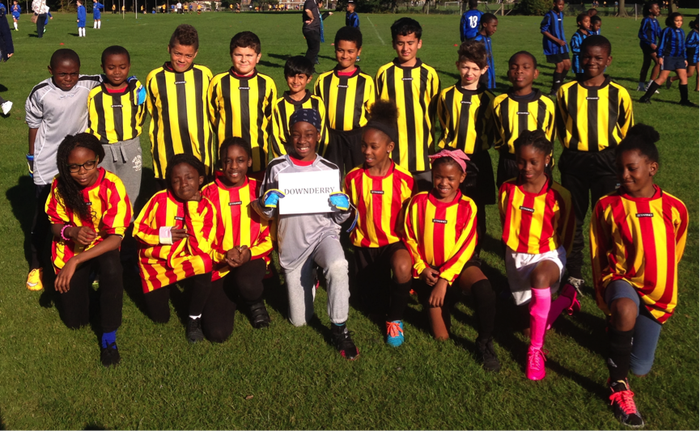 Saturday 10th October saw the year 6 football team kick off their Lewisham Schools League season, we headed to Blackheath for our first two fixtures of the year. The boys kicked off against Eliot Bank, a strong performance saw us start with a 2-0 victory with a goal in each half. The first was a well worked team goal, finished by Dominic. While we had a lot of possession there was a worrying moment when Eliot Bank were awarded a penalty for a handball. Luckily our goalkeeper, Phri, stood his ground as the penalty was struck straight down the middle of the goal and he was able to save it with ease, making sure we went into half time with a 1-0 lead. We managed to keep the ball for long periods of the second half, never looked like conceding a goal, and eventually the second goal was scored, which was an excellent long range effort from Atare. The second game was a far more convincing victory. The game was against St William of York, after a great strike from Dominichad put us 1-0 ahead, we created several chance but just couldn't find the second goal. Eventually our pressure paid off when Reece calmly slotted the ball home as we went into half time with a 2 goal lead. Shortly after the start of the second half, Jerome slotted the ball home from a tight angle to put us well in control of the game. Finally after some great counter attacking the unselfish Suraj play a pass across the penalty area to Reece who was unmarked to finish with ease and make the score 4-0. After some very good performance from everyone, one player stood out, not just for Mr Hitch but in the eyes of his team mates so the player of the day award went to Dominic of Hawthorn Class. On Thursday, our upper key stage 2 teams played in a football festival at Whitefoot Lane Playing Fields. Our teams showed all the qualities we had hoped they would display, including team spirit, determination and resilience. Unfortunately, it wasn’t quite enough on this occasion to win. Our boys team finished fifth while our girls team finished second, losing out on first spot by just one point. We are very proud of all of you. Well done to Mishka, Alyssia, Taija, Priscilla, Oprah, Mariah, Aiysha, Angel, Ali, Bernny, Jerome, Atare, Kieren, Luke, Timel, Dominic, Suraj and Arian. On Thursday 12th March, a team of year 4 and year 5 boys competed at a football festival at Sedgehill Secondary School. Our team came second and Jerome won the 'Player of the Festival' award. Team Manager, Mr Hitch, described the team's attitude and effort as 'excellent'. On Friday 30th January 2015, Downderry Primary School sent a representative team to compete at the English Kids' Cup. This gave our team the chance to test themselves against the best teams in Lewisham and Southwark and potentially win an opportunity to play the national final in May at Wembley Stadium! Although our team played very well, they were not quite good enough on the day and were knocked out after coming second in their group - only the winners of each group progressed. Our team was: Reece, Atare, Dominic, Vinusan, Akash, Mikee, Dylan and Ovue. Well done for your attitude, effort and determination.